Summer has finally arrived and it’s time for poolside Popsicle treats! I have tried store bought Popsicle holders to help my toddlers eat Popsicle without a sticky mess, but nothing compares to this free option using recycled plastic lids as drip free Popsicle holder. 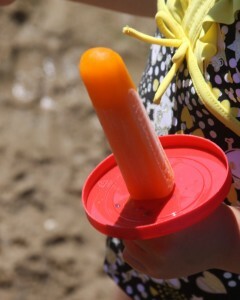 My kids love Popsicle, and enjoy them often throughout the summer months. They have always loved sitting outside on a nice warm day enjoying their brightly colored frozen treats. When they were very small I noticed that they really struggled to eat their Popsicles before they started melting all down their hands and arms. They would get so distracted by the sticky mess that then they were forgetting to keep eating their Popsicle quickly and start throwing fits because they were now messy, and not enjoying their treat at all. After that would usually come a fit because they wanted their Popsicle, even though it had all melted down their arms already while they were busy being mad at the mess. My cure for this problem has always been to use something that I know I already have on hand in the house and that would normally get discarded after I’m done with it. 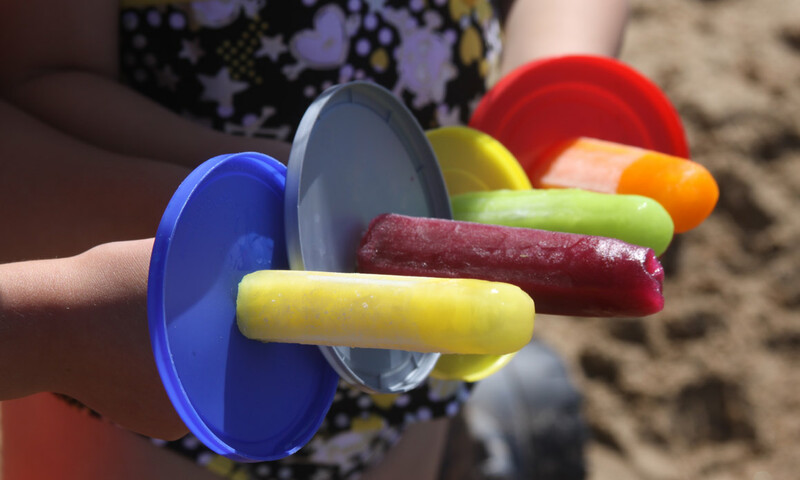 I re-use the small thin plastic lids from containers and turn them into Popsicle holders in seconds. I started saving all of the tops from the plastic containers that some refrigerated and non-perishable foods come in. Any size lid will do. 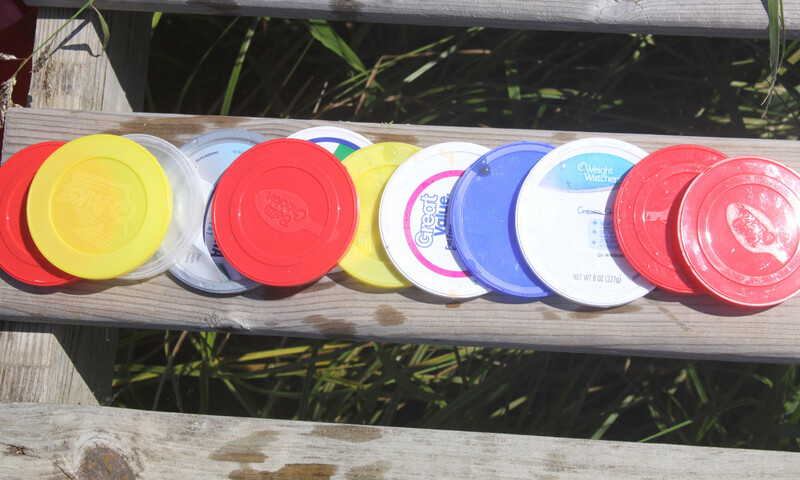 I use lids from containers like sour cream, frosting tubs, snack cups, cream cheese tubs, and marshmallow cream containers as well as a few other re closeable containers. It is so simple and completely free to make a drip free Popsicle holder for your kids. I simply take the top from one of the containers, wash it, and use a knife to make a small slit in the center of it (just large enough for a Popsicle stick to fit through). Then I slide the Popsicle stick through the slit with the lip of the container top pointing upwards. 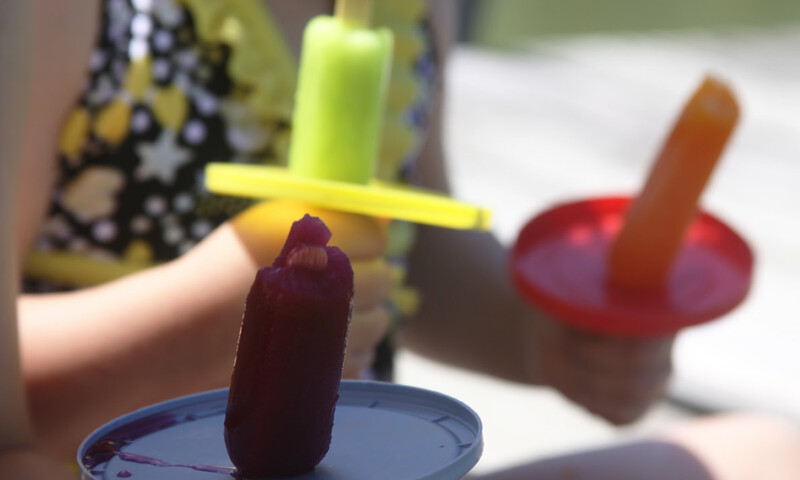 This acts as a little catch for melting Popsicle, and allows the kids to hold the Popsicle stick without anything dripping down their hands. It has always worked so well for my kids since they were old enough to eat Popsicles, and I still use them all of the time. My 5 year old is probably old enough to not need the holder, but I think he likes the mess free option! He is clever enough to sip the melted Popsicle juice from the lid, and finishes his Popsicle without any mess at all. I usually have a stash in a drawer in the kitchen so anytime we have kids visiting their are enough Popsicle holders for everyone. 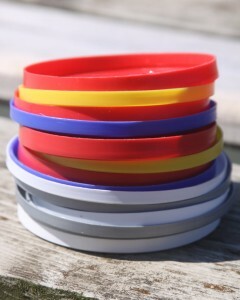 When we are done I just toss them on the top rack in the dishwasher and they are clean and ready for the next time. I have tried some store bought Popsicle holders (the kind that are reversible for ice cream cones and Popsicle treats, but get nothing but tears and a mess because the kids always seem to dump their treats out onto the ground. This option works great for us and I love that I am able to make them using something I already have and would just be tossing into the garbage or recycling anyway! My kids love them, and I hope yours do too! 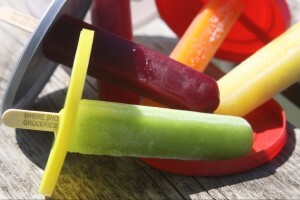 So break out the Popsicles and have a cold tasty treat on a nice hot day minus the sticky melted mess! A goofy mom that dances in her jammies with her kids, loving wife, uncontrollable crafter with creativity spewing from her brain into list of to-do projects.